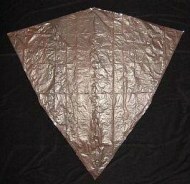 The Dowel Diamond is a fairly large tail-less kite, inspired by the famous Eddy design. However, it will still fit into nearly all road vehicles, ready to fly. Either just in front of the rear seat, or flat in the trunk (boot). This design is a great very-light to light wind flier. 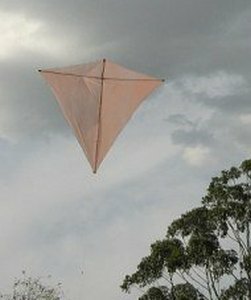 Setting up on the flying field is just a matter of attaching the bow-line toggle to put some curve into the horizontal spar. Then the flying line is attached to the bridle. At this point you are ready to launch! 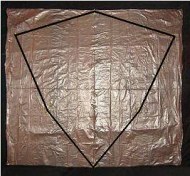 The method of attachment is illustrated further down this page. 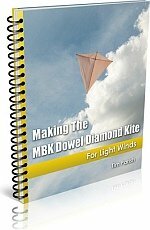 Now's the time to read up on the kite making tools and materials required for making a Dowel Diamond, if you haven't already. Using the marking pen, rule lines between the dots, as in the photo. For lines longer than the ruler, just add a few extra dots using one of the dowel spars as a ruler! Then it's easy to connect the dots. It's probably best not to rule the whole line with the dowel, since it bends easily. 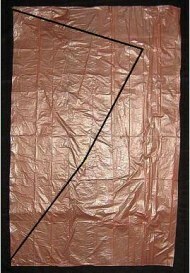 When doing the following, most of the width of the tape should be inside the kite's outline. Use a single length of tape for each line. Hold it out straight, touch it down to the plastic at one end, then at the other end, dab it down in the middle, then press down all along its length.